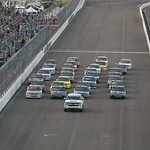 The Lucas Oil 150 marked the 22nd race of the 2017 NASCAR Camping World Truck season and 12th and final race for Austin Hill. Hill started 17th and was racing in the top-15 before being forced to the garage with a broken left-rear brake caliper. This was Hill’s first career NCWTS start at Phoenix International Raceway. 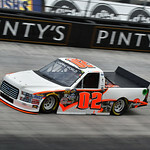 Johnny Sauter earned the victory and was followed to the finish line by John Hunter Nemechek, Cody Coughlin, Chase Briscoe and Kaz Grala. Hill along with Young’s Motorsports, announced Friday at the track that the Douglasville, G.A. native will once again join the team in 2018, competing full-time in the flagship No. 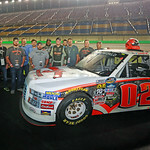 02 entry in the NASCAR Camping World Truck Series. Austin Hill and the No. 02 United Rentals Ford F150 team used the days lone practice session to work on making sure the truck handled well during the race. 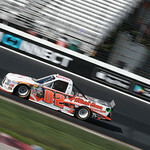 The team spent most of the session inside the top-10, based on speed, and ended the session with Hill reporting the truck was good on long run speed. 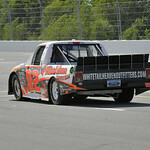 After advancing to the second round of qualifying, Hill was set to start the 150-lap race 17th. Making quick work of the initial start, Hill began picking up spots, until radioing to his crew that he had a flat tire at the end of Stage One. After pitting for four tires, fuel and a wedge and trackbar adjustment, Hill rejoined the field 18th and began working his way into the top-15 on the ensuing restart. Shortly after starting the final stage, Hill reported a bad vibration and brought his No. 02 United Rentals Ford to pit road. Once on pit road, the crew immediately diagnosed the problem as a broken right rear brake caliper, forcing Hill to the garage. Hill and the No. 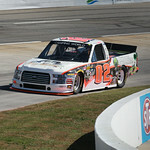 02 United Rentals Ford F150 were credited with a 23rd place finish.